ANALYSIS / Is Israel capable of extinguishing Iran's nuclear aspirations? Even though the New York Times story on June 19 about a large-scale air force exercise in the eastern Mediterranean was received from a source in Washington, not Jerusalem, it seems to have been in line with Israel's aims. Unlike the storm that the threats of Transport Minister Shaul Mofaz stirred two weeks ago, the report that the Israel Air Force (IAF) carried out a large scale exercise as part of its preparation for a scenario requiring the targetting of Iran's nuclear facilities, the message was received clearly. According to the senior Pentagon official quoted in the New York Times report "they [the Israelis] wanted us to know, they wanted the Europeans to know, and they wanted the Iranians to know." There is little new in the fact that the IAF is preparing for the Iranian challenge. About six months ago, Channel 2 reported a similar exercise covering a radius that an operation against Iran would require. At the time the report received little attention, but in view of the price of crude oil, every report of this sort makes the tickers jump. Moreover, the IDF spokesman did not deny Friday's report. If one followed the series of interviews that outgoing IAF chief Major General Eliezer Shkedi offered more than a month ago, the trend was obvious. Shkedi emphasized the force's readiness for "any challenge" and called on the media not to drop their daily focus on the Iranian threat. The former air force chief was without doubt the hawk at the General Staff in anything to do with dealing with Iran, but one must not forget that he was also the person assigned the task of preparing the operational planning. The defense establishment assessment as of June 2008 is that in 1.5 to two years Iran will cross the technological threshold enabling Tehran to develop nuclear weapons. Contrary to last December's U.S. National Intelligence Estimate (NIE) on Iran, Israel's assessment is that Tehran has not ceased its nuclear weapons program. There is still the possibility of an American attack on Iran, but in light of the NIE report that is not highly likely. The U.S. position may change dramatically if they have an undisputed 'smoking gun' regarding Tehran's intentions. However, there is another question that needs to be raised: What are the IAF capabilities in carrying out the kind of operation necessary against Iran's nuclear installations, its professionalism notwithstanding? Western military experts are divided over its ability to target the dispersed Iranian nuclear infrastructure, in dozens of installations, some buried deep underground. But Israel's effort would not be to completely destroy Iran's nuclear complex - blocking its progress for a period of time may be a significant achievement in itself. Prime Minister Ehud Olmert vowed during his passover interviews that Iran will not turn nuclear. This was not a random, thoughtless slip of the tongue. If in Jerusalem they were seriously thinking that it is necessary to get used to a nuclear balance of terror, we would have heard them lauding the rational regime that sits in Tehran. In Their First Joint Investigation, They Uncover Internal Documents from Diplomats Complaining about the Poor Quality of Al Hurra's Broadcast and Its Lack of Transparency and Professionalism. American taxpayers are paying for a Middle Eastern television network that broadcast an anti-Israeli diatribe as recently as last month, a joint investigation by 60 Minutes and ProPublica reveals. This, despite the fact that Al Hurra management promised Congress nearly two years ago that they would take measures to prevent such mistakes, which had occurred repeatedly before. The joint investigation will be broadcast on 60 Minutes Sunday, June 22 (7:00-8:00 PM, ET/PT) on the CBS Television Network and be detailed on ProPublica's web site at propublica.org simultaneously . But 60 Minutes and ProPublica monitored the broadcast last month and found a Palestinian guest named Hani El-Masri on its flagship show "Free Hour," calling Israel a "racist" state that is conducting its own "holocaust" against Palestinians. His exact quote, unchallenged by the host or balanced by another panel member, was "[Israel] is the occupying and racist state that imposes the stifling and deadly blockade and perpetrates a holocaust against 1.5 million Palestinians in Gaza." Conniff, who speaks no Arabic, says he was unaware of this and after looking into the matter, said, "Any implication that Al Hurra is anti-Israeli is absolutely wrong." Pressed by Pelley that critics say this latest example is part of a pattern, Conniff replies, "No. There's absolutely no pattern." He points out that the previous examples were last discovered a year and a half ago. At that time, members of Congress threatened to hold up funding because Al Hurra broadcast a live hour-long speech by Hassan Nasrallah, the leader of Hezbollah  a group considered by the U.S. to be a terrorist organization. A few weeks later, an Al Hurra reporter named Ahmed Amin delivered a biased report from the Holocaust Denier's Conference in Tehran. He said that while some participants were sure that millions of Jews died in Germany, "the group did not reinforce their statements with scientific evidence, but instead they were content to tell stories passed on to them by their ancestors." Soon afterward, irate members of Congress were assured that Ahmed Amin would be fired. ProPublica and 60 Minutes have learned that, 18 months later he was still on the U.S. government payroll. He was only fired after 60 Minutes and ProPublica began inquiring. The news director of Al Hurra who made the decisions to cover both the conference and Hezbollah speech was forced to resign. In his first interview since this controversy, Larry Register defends his decisions, telling Pelley he was trying to make Al Hurra more credible and relevant to people in the Middle East, where, according to an public opinion pollster, it gets just two percent of the audience. "I think you [increase your audience] by becoming more credible, covering more news more aggressively. Not just picking and choosing what you might want to cover because it's favorable for your side versus their side," he tells Pelley. Register points out that Al Hurra means "the Free One" in Arabic. He says the Nasrallah speech was big news and he points out every other Arab channel carried it live. "I considered it newsworthy," he says. .We are required to provide balance and objectivity." Glassman explains: "Our idea with Al Hurra was to create a network to provide high quality, professional journalism with American standards. I think we've done that." But there are many critics of Al Hurra, including U.S. diplomats, who complain in internal documents, about the poor quality and lack of professionalism of the Al Hurra broadcast. And former news director, Larry Register, says governments and journalism don't mix. "You can't make independent decisions if you have a government over you telling you what you can and can't do. It's a no win situation as I painfully found out," Register tells Pelley. ProPublica is an new independent, non-profit investigative journalism newsroom. It is led by Paul Steiger, former magaing editor of the Wall Street Journal. This is the first joint investigation in a continuing partnership between ProPublica and 60 Minutes. Attacking Iran would be a kind of engagement, no? I mean, he isn't really contradicting himself, is he? U.S. presidential candidate Barack Obama said Saturday that Israel is justified in providing for its security amid the "extraordinary threat" posed to it by Iran. Obama spoke after The New York Times quoted unnamed U.S. officials as saying that Israel had carried out a large military exercise this month that appeared to be a rehearsal for a potential bombing attack on Iran's nuclear facilities. Obama, a Democrat who is running against Republican John McCain in the November election, was asked at a news conference in Jacksonville, Florida whether Israel was right to carry out the exercise. "Without access to the actual detailed intelligence, I want to be careful about characterizing what was done and whether it was appropriate or not," Obama said in his capacity of Illinois senator. However, he added that Israel was right to be concerned about comments made against it by Iranian President Mahmoud Ahmadinejad and about Tehran's support for militant organizations Hezbollah and Hamas. "And so there is no doubt that Iran poses an extraordinary threat to Israel and Israel is always justified in making decisions that will provide for its security," Obama said. The New York Times said more than 100 Israeli F-16 and F-15 fighters took part in the maneuvers over the eastern Mediterranean and Greece in the first week of June. Israel's ambassador to the United States, Sallai Meridor, also talked of the threat posed by Iran in an interview with CBS News. "We cannot take this threat lightly and as our prime minister recently said Israel will not tolerate a nuclear Iran," Meridor told the U.S. television network. Asked how much time was left before the diplomatic window closes, Meridor replied, "Less today than we had yesterday, and it's running out." "Read the writing on the wall" the official urged Iran. "This was a dress rehearsal, and the Iranians should read the script before they continue with their program for nuclear weapons. If diplomacy does not yield results, Israel will take military steps to halt Tehran's production of bomb-grade uranium." What efforts on the part of Israeli officialdom will be required to finally shut up all the loudmouths? An Israeli political official familiar an Israeli drill reportedly held in preparation for a military raid on Iran's nuclear facilities told the London-based Times on Saturday that the Iranians should view the exercise as a warning. The New York Times on Friday cited unidentified American officials as saying that more than 100 Israeli F-16 and F-15 fighter jets took part in the maneuvers over the eastern Mediterranean and Greece during the first week of June. Prime Minister Ehud Olmert's office declined to comment on the reported exercise, but a senior lawmaker in his Kadima Party said Saturday that diplomatic efforts to curb Iran's nuclear program have failed and that the next 1-2 years would be critical. Tzachi Hanegbi, who heads the Knesset Foreign Affairs and Defense Committee, told Israel Radio that the world had to decide how to proceed. An Israeli military spokesman said of the report: "The Israeli Air Force regularly trains for various missions in order to confront and meet the challenges posed by the threats facing Israel." Meanwhile, in remarks aired Friday, the head of the United Nations nuclear watchdog said that he would resign if a military attack was launched against Iran, warning that any such attack would turn the region into a "fireball." International Atomic Energy Agency Director General Mohammed ElBaradei told Al Arabiya television that "I don't believe that what I see in Iran today is a current, grave and urgent danger. If a military strike is carried out against Iran at this time ... it would make me unable to continue my work." "A military strike, in my opinion, would be worse than anything possible. It would turn the region into a fireball," he said, emphasizing that any attack would only make the Islamic Republic more determined to obtain nuclear power. Earlier Friday, Oil prices jumped more than $3 on Friday on reports of rising tensions between Israel and Iran. A hardline Iranian cleric said Friday that Israel and its U.S. ally would receive a "slap in the face" if they speak of using force against the Islamic Republic, a member of the Organization of Petroleum Exporting Countries (OPEC). Energy experts are concerned any conflict in Iran could lead to a shutdown of the Strait of Hormuz, a waterway separating Iran from the Arabian Peninsula, through which roughly 40 percent of the world's traded oil is shipped. Friday's spike was not the first caused by tensions between Israel and Iran. Oil prices soared $11 on June 6, after former Israel Defense Forces Chief of Staff and Transportation Minister Shaul Mofaz said in a newspaper interview that "if Iran continues with its program for developing nuclear weapons, we will attack it. The sanctions are ineffective. Attacking Iran, in order to stop its nuclear plans, will be unavoidable." Adding to oil's gains Friday, Royal Dutch Shell shut 220,000 barrels of daily production in Nigeria after militants in speedboats attacked the Bonga offshore oil facility. Shell said it was too soon to say how long output at the deepwater installation would be shut. Nigeria, another OPEC member, is already producing about 20 percent below potential due to sabotage by militants in the Niger Delta oil hub. The gains marked a reversal from heavy losses Thursday that had been triggered by news China was raising domestic fuel prices -- a move that could slow demand growth in the world's second largest energy consumer -- and expectations Saudi Arabia was planning a 6 percent output hike. "The petroleum markets rebounded ... on worries that Israeli military exercises held in the first week of June might have been preparation for a strike against Iranian nuclear facilities," said Tim Evans, energy analyst for Citi Futures Perspective in New York. U.S. July crude, which was expiring on Friday, rose $3.12 to $135.05 a barrel by the evening, off highs of $136.80. London Brent was up $3.06 at $135.06. Oil prices had plunged nearly $5 in the previous session after China raised fuel prices by up to 18 percent, its first hike in eight months, as the government bowed to a nearly $40 increase in crude prices since the last hike in November. Initial forecasts suggested the move by China would hurt demand, but some analysts now say consumption could rise as the price increase will encourage healthier supply at the pumps. Chinese fuel retailers have had to deal with long queues of customers and rationing as refiners cut back on production to limit hefty losses made by selling discounted fuel. "We do not think that a country where consumers are used to waiting 3 hours for automotive fuel in many cases will see significant negative demand elasticity from a simple 20 percent price increase," said Citi analyst James Neale. Demand for oil by China, India and the Middle East has been cited as a factor behind crude's almost sevenfold surge from $20 six years ago to a record high of nearly $140 a barrel. Oil's rally on Friday also came despite assurances from Saudi Arabia that it was raising its production after months of pressure from consumer nations calling for more supply. Saudi Oil Minister Ali al-Naimi confirmed on Friday the kingdom will be pumping 9.7 million barrels per day of crude in July, an increase of 550,000 barrels per day since May. Oil traders said Friday's strength was also supported by a weaker dollar, which improves the purchasing power of buyers using other currencies and encourages investors to ply money into commodities as a hedge against inflation. Contradictions between what is needed for the home market and what is needed to please international opinion can keep Arab world spinmeisters busy. A case in point is Egypt, the recipient of $2 Billion in US aid and a supposed peace partner with Israel. Egyptian culture minister Farouk Hosni is nominated by France for a UN job. (See Talk Like an Egyptian). But oops! - he happened to say in a parliamentary debate (for internal consumption) that he would burn Israeli books. Even in France they think that is a bit extreme these days. Chirac is no longer in power. While transmitting peace light and liberalism abroad, Egypt, like other Arab regimes, has a different program for the home audience. Textbooks villify Jews. Media broadcast anti-Semitic materials that perpetuate the blood libel and the myth of the Protocols of the Elders of Zion. Egyptian government control journals publish slander and polemics about the evils of Israel and the United States, not hesitating to bite the hand that feeds them, and to bite hard. Imam's regularly call for Jihad against Israel, and oppose "terror" unless it involves killing Jews. Not surprisingly, this double dealing sometimes gets government figures in trouble, as explained below. Minister Hosni will try to brush off the whole incident in which he advocated book burning for Israeli publications. It is a "misunderstanding" you see. He is twisting and squirming, but just gets deeper into his own lies. It is not his fault alone, for he represents an entire system. One remark might be due to a misunderstanding. But every issue of Al Ahram, and all the Egyptian legislation against Christians and persecution of Christians, and all the incitement in educational materials and media - can all these be a "misunderstanding?" June 21 (Bloomberg) -- An Israeli military exercise interpreted as a rehearsal for a strike on Iran will bolster a diplomatic drive to curb its nuclear program, a senior U.S. official said. The American official, who spoke on condition he not be identified, said the June 2 drill by Israeli warplanes wasn't initiated or authorized by the U.S., which also didn't voice opposition after it was disclosed yesterday. ``We are clearly in a situation where the Israelis and United States are trying to bolster diplomacy but indicating there are other options,'' said Michael Eisenstadt, a defense analyst at the Washington Institute for Near East Policy. A reminder of the powerful media presence of Arab and Muslim pressure groups and interests, the legitimacy of which is never questioned. The Council of Arab Information Ministers called for the formation of a general commission for Arab Information, at a meeting here, Thursday, and discussed a common media strategy for the member countries. Iyad Bin Ameen Madani, Saudi Minister of Culture and Information, said in a statement after the meeting, the council stressed on the need of giving media support for the Arab issues. The council also decided to follow up on the activities of Joint Arab Information abroad, and to set up a mechanism to activate the principles of organizing satellite transmission in the Arab region. The satellite transmission organizing principles document was endorsed on the basis of the domestic legislations of each Arab country, the minister said. BAGHDAD, Iraq (CNN) -- A car bombing that killed dozens Tuesday in a predominantly Shiite area of Baghdad may have been conducted by a militant trying to incite Shiite violence against Sunnis, the U.S. military said Wednesday. Authorities said Wednesday that 63 people died in the strike and 71 others were wounded. Of the dead, four were women and five were children. Among the wounded were 11 women and 12 children. The blast happened when a minibus detonated at a garage and a bus stop in the Hurriya neighborhood, ripping through a nearby market and buildings. Lt. Col. Steve Stover, a U.S. military spokesman, said the military believes Haydar Mehdi Khadum al Fawadi, a leader of an Iranian-backed Shiite militant cell, was involved. "Our intelligence, corroborated through multiple sources, is this atrocity was committed" by a cell led by al Fawadi, Stover said. "We believe he ordered the attack to incite Shia violence against Sunnis," said Stover, who called al Fawadi a "murderous thug." Should this guy be free? Radical cleric Abu Qatada has been variously described as "Osama bin Laden's right-hand man in Europe" and a "truly dangerous individual". The Palestinian-Jordanian is to be released from prison on strict bail conditions, including a 22-hour curfew. His release from Long Lartin jail in Worcestershire in June 2008 comes after he won a victory in April 2008 to remain in the UK when the Court of Appeal blocked his deportation to Jordan. But the government is challenging that court move - which is based on fears that evidence gained from torture may be used in any future trials. Qatada became one of the UK's most wanted men in December 2001 when he went on the run on the eve of government moves to introduce new anti-terror laws allowing suspects to be detained without charge or trial. The 45-year-old father-of-five arrived in the UK in September 1993 on a forged United Arab Emirates passport. He was allowed to stay in June 1994 after claiming asylum for himself and his family. 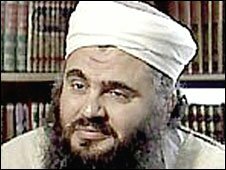 In the mid-1990s Abu Qatada was said to have held meetings with an MI5 officer at which he suggested his willingness to co-operate to help prevent Islamist terrorism in the UK. But tapes of his sermons were unearthed in a Hamburg flat used by some of those responsible for the 11 September attacks on the US. And Mr Justice Collins later said it appeared his attitude to "possible attacks in or against the interests of the UK" had changed after 11 September. Richard Reid, the would-be mid-Atlantic Shoe bomber, and Zacarias Moussaoui, both jailed for involvement in terrorism, are said to have sought religious advice from him. Former Home Secretary David Blunkett once described him as the most significant extremist preacher in the UK. But Qatada has always publicly distanced himself from claims of links to al-Qaeda and insists he has never met its leader, Osama Bin Laden. 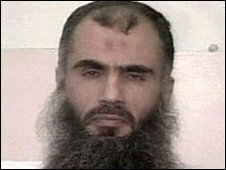 In February 2001, Abu Qatada was questioned by anti-terrorism police over alleged connections to a German cell. Officers found the father-of-five in possession of £170,000 cash, including £805 in an envelope labelled "For the Mujahedin in Chechnya" but no charges were brought. In October 2002 the authorities tracked Qatada, also known as Omar Mahmoud Mohammed Othman, down to a council house in south London and took him to Belmarsh Prison. He was eventually freed on bail in March 2005, but was made subject of a control order to limit his movement and contact with others. In August he was taken back into custody pending extradition to Jordan, where he has been found guilty of terrorism offences in his absence. In December 2005, Abu Qatada made a video appeal to the kidnappers of British peace activist Norman Kember in Iraq. The recording, made when Qatada was in Full Sutton jail, near York, was broadcast in the Middle East. Mr Kember later went on to donate to Qatada's bail fund, saying he had been in prison without trial for too long. Former neighbours in Acton, west London, said Abu Qatada and his family had not lived in the area for about a year before his latest detention. "He seemed very private, but always said hello in the street," one said. "We didn't think that Mr Abu Qatada was a radical." "If Only Americans Knew" - What every American and everyone else needs to know about Israel and the Palestinians. Palestinians, aided by "humanitarian" organizations and UN officials, have insisted that Gaza is under siege by Israel and that there is a "humantarian crisis" perpetrated by Israeli actions. The truth is, that the Gaza leadership of the genocidal Hamas has been waging a propaganda war against Israel and a humanitarian war against its own people. Fuel meant for hospitals is commandeered for "police" vehicles and terrorists who drive around launching rockets at Israel. Gaza will go down in history as a unique "siege" in which a country that was being pounded by rocket fire provided food and fuel to a vicious genocidal enemy bent on its destruction. It is also unique because it is the only time in history that a country has been condemned for "human rights" violations because it was defending itself against a rogue regime. Below is the record of shipments of humanitarian assistance to Gaza from Israel. Let's not forget that Hamas terrorists shot up the fuel depot to prevent fuel supplies. Let's set the record straight about the "Gaza Siege." The record is below. Ministry of Defense Unit of Coordination of Government Activities in the Territories (COGAT) Total (June 16, 2007 - June 13, 2008): 24,358 trucks; 571,852 tons "No humanitarian crisis and no hunger in the Gaza Strip"
The data for the supplies transferred via the Karni and Sufa crossings is based on the reports of Palestinian merchants. Two-way traffic at the Erez Crossing of international organizations' staff, patients seeking medical treatment and people accompanying them ("medical evacuations"), and Palestinian civilians has been permitted for humanitarian and medical aid since 18 January 2007 and occurs almost daily. Via the conveyor at the Karni Crossing, hundreds of tons of grain - wheat, barley, soy beans, corn and animal feed - are transferred from Israel to the Gaza Strip every week. Via the Nahal Oz fuel depot, diesel fuel for transportation and the local Gaza power station, petrol, and gas for cooking and heating are transferred from Israel to the Gaza Strip, according to an assessment of civilian needs mandated by the Israeli court. Via the Sufa Crossing, the following supplies are transferred by truck from Israel to the Gaza Strip: food, including: baby formula and food, rice and legumes, fruits and vegetables, meat, chicken and fish, dairy products, flour and yeast, oil, salt and sugar; hygiene products; raw materials for essential infrastructures; medicines and medical equipment; and a myriad of other items - ranging from school books to wheel chairs - needed by the civilian population. The Kerem Shalom Crossing has been closed since 19 April 2008, due to terrorist attacks directed at it. 51 trucks carrying mostly food products were transferred from Israel to the Gaza Strip via the Sufa crossing. Via the Nahal Oz crossing, 510,000 liters of diesel fuel for the power station, 130,000 liters of diesel fuel for transportation, and 173 tons of gas were delivered. In addition, 55 people (patients and their companions) crossed into Israel via Erez crossing for medical treatment. 38 trucks carrying fruit and vegetables and other food products as well as materials for humanitarian infrastructure were transferred from Israel to the Gaza Strip via the Sufa crossing. In addition, 54 people (patients and their companions) crossed into Israel via Erez crossing for medical treatment. 59 trucks carrying food, materials needed for infrastructures, and medications were transferred from Israel to the Gaza Strip via the Sufa crossing. 24 trucks carrying 888 tons of grain were transferred via the Karni crossing. Via the Nahal Oz crossing, 280,000 liters of diesel fuel for the power station, 100,000 liters of diesel fuel for transportation, and 88 tons of gas were delivered. In addition, 66 people (patients and their companions) crossed into Israel via Erez crossing for medical treatment. 521,800 liters of fuel and 84 tons of heating gas were transported via the Nahal Oz terminal. In addition, 10 people (patients and companions) crossed into Israel from the Gaza Strip via the Erez crossing for medical treatment. 50 trucks carrying food and hygiene products were transferred from Israel to the Gaza Strip via Sufa crossing. 64 trucks carrying 2,409 tons of wheat, corn, soy beans and animal feed were transferred via the Karni crossing. Cooking gas was transferred via the Nahal Oz fuel depot. In addition, 17 people (patients and companions) crossed into Israel from the Gaza Strip via the Erez crossing for medical treatment. Medical evacuation: A Palestinian worker was critically wounded by a mortar bomb fired by Palestinian terrorists towards the Nahal Oz fuel depot. He was rushed to hospital in Gaza City. Due to the critical wounds the worker suffered and the deterioration of his condition, an urgent request was forwarded to the Israeli Coordination & Liaison Administration at the Erez crossing, to refer the wounded man for further treatment in Israel. Colonel Nir Press, Head of Israel's Coordination and Liaison Administration at Erez Crossing, approved the evacuation to Barzilai Hospital in Ashkelon as per the request. Press stated that evening: "The attack earlier today caused the casualty of one Palestinian, and ultimately forced the early cessation of pumping of fuel and gas. The Hamas campaign against the Gaza Strip crossings primarily inflicts suffering on the people of the Gaza Strip. 60 trucks carrying food, and raw materials for essential infrastructures were transferred to the Gaza Strip via Sufa crossing. At the Nahal Oz fuel depot, 261 tons of gas and 1. 124 million liters of fuel for transportation and electricity were transferred. In addition, 32 people (patients and companions) crossed into Israel for medical treatment. 64 trucks carrying rice, vegetables, meat/chicken/fish, dairy and other food products, and raw materials for essential infrastructures were transferred to the Gaza Strip via Sufa crossing. 71 trucks carrying 2,577 tons of wheat, soy beans, corn and animal feed were transferred via the Karni grain depot. At the Nahal Oz fuel depot, 260,410 liters of fuel for transportation and 732,400 liters of fuel for the power station, and 210 tons of heating and cooking gas were transferred to the Gaza Strip. In addition, 13 people (patients and companions) crossed into Israel via the Erez crossing for medical treatment. 30 trucks carrying vegetables, meat/chicken/fish, dairy and other food products, medications and medical equipment, and raw materials for essential infrastructures were transferred to the Gaza Strip via Sufa crossing. 64 trucks carrying 2,500 tons of wheat, soy beans, corn and animal feed were transferred via the Karni grain depot. At the Nahal Oz fuel depot, 1. 038 million liters of fuels and 262 tons of gas were transferred to the Gaza Strip. In addition, 29 people (patients and companions) crossed into Israel via the Erez crossing for medical treatment. 71 trucks carrying 2,610 tons of wheat, soy and animal feed were transferred to the Gaza Strip via the Karni conveyor. Via the Nahal Oz depot, 110 tons of cooking and heating gas were transferred. This week, 70,030 liters of petrol (out of 75,400 allocated), 693,450 liters of transportation fuel (out of 800,000) and 2,097,400 (out of 2,200,000) liters of diesel fuel for the power station were transferred. May 28 for medical treatment. 62 trucks carrying 1,260 tons of wheat, 72 tons of barley and 900 tons of animal feed were transferred to the Gaza Strip via the Karni grain depot. 72 trucks with food, hygiene products, medicines and supplies for essential infrastructures were transferred to the Gaza Strip via Sufa crossing. Via the Nahal Oz fuel depot, 70,030 liters of petrol, 253 tons of gas, 155,000 liters of fuel for transportation and 736,200 liters of fuel for the power station were transferred. In addition, eight people crossed into Israel for medical treatment. 66 trucks carrying baby food, agricultural produce and equipment, meat/chicken/fish, dairy products and other food, medicines, and supplies for essential infrastructures were transferred to the Gaza Strip via Sufa crossing. 170 tons of gas and 1. 01 million liters of diesel fuel were transferred via Nahal Oz. In addition, 27 people (patients and their companions) crossed into Israel for medical treatment. 75 truckloads (2690 tons) of wheat, barley, corn, soy, sesame seeds and animal feed were transferred from Israel to the Gaza Strip via the Karni grain depot. 66 truckloads of agriculture produce, meat/chicken/fish, dairy products, other food, supplies for essential infrastructures and medical equipment were transferred via Sufa crossing. 245 tons of gas, 270,420 liters of fuel for transportation and 619,200 liters of fuel for the power station were transferred via the Nahal Oz depot. May, 300,000 liters of fuel were transferred via the Nahal Oz depot into the Gaza Strip for the use of UNWRA. 43,010 liters of gasoline and 159 tons of gas were transferred; 1,116,830 liters of fuel for transportation, more than the 800,000 liters allocated, and 2,177,200 liters of fuel out of the 2,200,000 liters allocated for the power station were transferred. The truck bomb attack on the Erez crossing prevented 31 Palestinians from receiving medical treatment in Israel. : 59 trucks with food, medical supplies, and agricultural produce and equipment were transferred to the Gaza Strip via the Sufa crossing point. 88 tons of gas and 469,000 liters of diesel fuel were transferred via the Nahal Oz depot. 957 million liters of fuel for power plants were transferred, out of the 2. 2 million liters allocated weekly. In addition, 36 people (patients and companions) crossed from the Gaza Strip into Israel for medical treatment. : 65 humanitarian aid trucks carrying baby food, agricultural produce, meat & fish, hygienic products, milk products, salt & sugar, medical equipment and medicines, oil, flour and yeast were transferred to the Gaza Strip via the Sufa crossing point. In addition, 65 people (patients and companions) crossed into Israel from the Gaza Strip for medical treatment via Erez crossing. 81,000 liters of fuel for transportation and 1. 488 million liters of diesel fuel for power plants were transferred via the Nahal Oz crossing. 71 truckloads of humanitarian aid (food, hygiene products, tools and raw materials for infrastructures) were transferred via the Sufa crossing. Eleven tankers (242 tons) of gas for heating and cooking were transferred via the Nahal Oz depot. In addition, 49 people (patients and companions) crossed into Israel from the Gaza Strip for medical treatment. : 69 humanitarian aid trucks carrying wheelchairs, walking sticks, additional medical equipment, food supplies and camping equipment were transferred to the Gaza Strip via Sufa crossing point. In addition, 83 people (patients and companions) crossed from the Gaza Strip into Israel for medical treatment. : 2,407,000 liters of fuel (petrol and diesel) were transferred to the Gaza Strip via Nahal Oz fuel depot. : 70 humanitarian aid trucks carrying vaccines, electric wires, hygiene and food products and other materials were transferred to the Gaza Strip via the Sufa crossing point; 27 trucks carrying grains and coffee were transferred via the Karni crossing; 120 tons (5 tankers) of heating gas and 560,000 liters (11 tankers) of fuel were transferred via the Nahal Oz crossing. In addition, 57 people (patients and companions) crossed into Israel from Gaza for medical treatment. Approximately 64 trucks of humanitarian aid and supplies were transferred into the Gaza Strip today via Sufa crossing. The assistance was organized with the Coordinator of Government Activities in the Territories. The following is a list of supplies transferred: diapers, fruit, meat, flour, corn, oil, cocoa powder, dairy products, sugar, toilet paper, garlic, fish, ful, carrots, nylon bags, reproductive eggs, cleaning products and medical equipment. Approximately 85 trucks of humanitarian aid and supplies were transferred into the Gaza Strip today via Sufa crossing. In addition, 1 million liters of fuel were transferred via Nahal-Oz. The following is a list of supplies transferred through Sufa crossing: oil, paper, meat, nylon bags used for greenhouses, rice, fruit, juice, sugar, milk, dairy products, flour, washing powder, salt, cleaning products, medical equipment, fish, fuel, disposable dishes, pasta, conserves, vegetables and humus. Approximately 27 trucks of humanitarian aid and supplies were transferred into the Gaza Strip today via the Kerem Shalom crossing before it was forced to close due to the attack on the crossing. Supplies transferred through the Kerem Shalom crossing: oil, paper, meat, nylon bags used for greenhouses, rice, fruit and halva. In addition, 800,000 liters of diesel fuel for heating and 240,000 tons of gas were transferred via Nahal Oz, which also closed during the afternoon after Palestinian snipers fired at the crossing. Approximately 95 trucks of humanitarian aid and supplies were transferred into the Gaza Strip today via the Kerem Shalom and Sufa Crossings: 59 trucks trough the Sufa Crossing containing: cleaning products, rice, dairy products, fruit, sugar, humus, meat, spices, flour, salt, garlic, fish, starch, hypochlorite, fennel, pea, pasta, hatching eggs and disposable plates. 36 trucks, including 11 trucks of Egyptian donation through the Kerem Shalom crossing containing: oil, paper, single-use dishes, medical equipment, diapers, preservatives, nylon bags, gloves, drip irrigation system, pipes and pads. The supply of diesel fuel for the Gaza power plant and cooking gas was resumed at 14:30 through the Nahal Oz fuel terminal. The fuel depot is 70% full (188,000 liters of gasoline and 820,000 liters of diesel fuel). The Palestinians in Gaza have refrained for the last two weeks from providing this available fuel to the Palestinian people. Approximately 100 trucks of humanitarian aid and supplies were transferred into the Gaza Strip today via the Kerem Shalom and Sufa Crossings: 67 trucks through the Sufa Crossing containing: drippers, seeds, cleaning products, rice, sugar, meat, flour, salt, fruit, carrots, garlic, corn, pasta, fruit, humus, eggs, cinnamon, fish and cloth. 33 trucks through the Kerem Shalom crossing containing: medications, mushrooms, bandages, bottles, cloths, diapers, canned food, oil, toilet paper, timber and cable clips. Defense Minister Ehud Barak ordered the renewal of diesel shipments to Gaza's power station. Only the minimal amount required to maintain the station's operations, determined in the past, will be transferred. April 16, after the completion of security arrangements between the IDF and Dor Energy. Approximately 123 trucks of humanitarian aid and supplies were transferred into the Gaza Strip today via the Kerem Shalom, Karni and Sufa Crossings: 54 trucks trough the Sufa Crossing containing: medications, cleaning products, rice, sugar, meat, dairy products, washing powder, flour, salt, fruit, carrots, halva, starch, eggs, cinnamon, yeast, fish and cloth. 51 trucks through the Karni crossing containing: wheat, barley, soy, lentils and sesame. 18 trucks through the Kerem Shalom crossing containing: medical equipment, medications, electrical equipment, conserves, paper, nylon, diapers, toilet paper, oil, wood for greenhouses, pumps and drip irrigation system. 87 trucks of humanitarian aid and supplies were transferred into the Gaza Strip today via the Sufa and Kerem Shalom crossings. The supplies included rice, vegetables, meat/chicken/fish, other food stuffs, and hygiene products. In addition, 71 people (patients and companions) crossed into Israel from the Gaza Strip for medical treatment via Erez crossing. Approximately 95 trucks of humanitarian aid and supplies were transferred into the Gaza Strip today via the Kerem Shalom and Sufa Crossings: 55 trucks through the Sufa Crossing containing: salt, carrot, fruit, rice, sugar, spices, dairy products, meat, flour, garlic, fish, pasta, frozen vegetables, coffee, cleaning products, hatching eggs. 30 trucks through the Kerem Shalom Crossing containing: oil, rice, medical equipments, diapers, cleaning products, toilet paper, shampoo and soap. 10 trucks donated by Egypt, through the Kerem Shalom Crossing containing: flour and sugar. Approximately 90 trucks of humanitarian aid and supplies were transferred into the Gaza Strip today via the Kerem Shalom and Sufa Crossings: 61 trucks through the Sufa Crossing containing: baby formula, salt, rice, fruit, flour, dairy products, sugar, garlic, carrots, milk powder, frozen vegetables, cardamon, eggs, fish, food additives, humus and tea. 29 trucks through the Karni Crossing containing: medicine and medical equipment, boiler for a hospital, oil, nylon bags, cleaning products, yeast, shampoo, toilet paper, halva and tehina. In addition, 655,000 liters (13 tankers) of fuel and 282 tons of heating gas (11 tankers) were transported through the Nahal Oz Crossing. Approximately 128 trucks of humanitarian aid and supplies were transferred into the Gaza Strip today via the Kerem Shalom, Sufa and Karni Crossings: 56 trucks through the Sufa Crossing containing: salt, tea, garlic, sugar, carrot, apples, dairy products, meat, fish, hatching eggs, animal vitamins. 40 trucks through the Karni Crossing containing: wheat, cumin, sesame, coriander, barley. 32 trucks through the Kerem Shalom Crossing containing: soy, yeast, salt, cleaning products, toilet paper, soap, hair shampoo & conditioner. In addition, 650,000 liters (13 tankers) of fuels and 176 tons of heating gas (8 tankers) were transported through the Nahal Oz Crossing. Approximately 76 trucks of humanitarian aid and supplies were transferred into the Gaza Strip today via the Kerem Shalom and Sufa Crossings: 60 trucks through the Sufa Crossing containing: books, baby kits, food kits, fruit, rice, oil, meat, milk, flour, red pepper, eggs and tea. 16 trucks through the Kerem Shalom Crossing containing: wheel chairs, sugar, flour and other basic food products. In addition, 705,000 liters (15 tankers) of fuels and 177 tons of heating gas (7 tankers) were transported through the Nahal Oz Crossing. Approximately 100 trucks of humanitarian aid and supplies were transferred into the Gaza Strip today via the Kerem Shalom and Sufa Crossings: 63 trucks through the Sufa Crossing containing: fruit, rice, sugar, dairy products, meat, fish, flour, garlic, medicine, cocoa powder, carrot, yeast, hatching eggs. 37 trucks through the Kerem Shalom Crossing containing: rice, sugar, coffee, oil, flour, pasta, tea, toilet paper, cleaning products, diapers, medicine. Approximately 111 trucks of humanitarian aid and supplies were transferred into the Gaza Strip today via the Kerem Shalom, Sufa and Karni Crossings: 59 trucks through the Sufa Crossing containing: fruit, rice, sugar, dairy products, garlic, meat, flour, paper, medicine, salt, meat preservatives, cocoa powder, fish, pasta and yeast. 27 trucks through the Karni Crossing containing: wheat and construction materials. 25 trucks through the Kerem Shalom Crossing containing: school equipment, shampoo, toilet paper, washing powder, soap, diapers, oil, rice and wet wipes. Approximately 138 trucks of humanitarian aid and supplies were transferred into the Gaza Strip today via the Kerem Shalom, Sufa and Karni Crossings: 51 trucks through the Karni Crossing containing: wheat, sesame, corn, coffee, soy. 56 trucks through the Sufa Crossing containing: fruit, rice, sugar, dairy products, meat, fish, flour, carrot, garlic, pasta, cleaning products, school books. 18 trucks through the Kerem Shalom Crossing containing: soap, rice, meat, oil, sugar, coffee, animal vitamins. 13 trucks donated by Egypt, through the Kerem Shalom Crossing containing rice and sugar. In addition, 746,000 liters (15 tankers) of fuel and 273 tons of heating gas (11 tankers) were transported through the Nahal Oz Crossing. Approximately 78 trucks of humanitarian aid and supplies were transferred into the Gaza Strip today via Kerem Shalom and Sufa Crossings: 57 trucks through the Sufa Crossing containing: powdered milk, dairy products, sugar, cleaning products, washing powder, fruit, rice, fish, meat, flour, coffee, vitamins, carrots, garlic and reproduction eggs. 21 trucks through the Kerem Shalom Crossing containing: washing powder, cleaning products, oil, nylon, plastic bags, diapers, hygiene products, jam, shampoo and medicine. In addition, 687,000 liters (15 tankers) of fuel and 300 tons of heating gas (12 tankers) were transported through the Nahal Oz Crossing. A total of 502 tons of humanitarian aid and fuel were transported. Sufa Crossing - 18 trucks were unloaded. Kerem Shalom Crossing - 24 trucks were unloaded. 139 trucks of humanitarian aid and supplies were transferred into the Gaza Strip today: 43 trucks via the Karni crossing grain conveyor carrying 1,548 tons of wheat, barley, corn, soy and animal feed. 64 trucks through the Sufa Crossing containing: sugar, powdered milk, bananas, dairy products, meat/fish, fruit, carrots, salt, coffee, flour, rice, garlic, frozen vegetables, medical equipment. 22 trucks through the Kerem Shalom Crossing containing: oil, pasta, rice, sugar, coffee, ketchup, mayonnaise, soap, diapers, shampoo, toilet paper. 691,000 liters (15 tankers) of fuel and 282 tons of heating gas (11 tankers) were transported through the Nahal Oz Crossing. In addition, 86 people (patients and companions) crossed into Israel for medical treatment via the Erez crossing. Approximately 149 trucks of humanitarian aid and supplies were transferred into the Gaza Strip today via the Kerem Shalom, Sufa and Karni Crossings: 26 trucks through the Kerem Shalom Crossing and 49 trucks through the Sufa Crossing containing: cocoa, powered milk, jam, oil, peas, tissue, diapers, toilet paper, medical supplies. 65 trucks through the Karni Crossing containing: wheat, corn, sesame, grains. 58 trucks through the Sufa Crossing containing: dairy products, sugar, fruit, meat, rice, flour, oil, carrots, pasta, garlic, fish, reproduction eggs, salt, tea, medical supplies, ketchup, vegetables. In addition, 668,000 liters (14 tankers) of fuel and 356 tons of heating gas (12 tankers) were transported through the Nahal Oz Crossing. Approximately 164 trucks of humanitarian aid and supplies were transferred into the Gaza Strip today via the Kerem Shalom, Sufa and Karni Crossings: 37 trucks through the Kerem Shalom Crossing and 49 trucks through the Sufa Crossing containing: rice, fruit, fish, meat, chicken, dairy products, salt, sugar, flour, oil, medicine. 5 trucks donated by Egypt, through the Kerem Shalom Crossing containing: flour and rice. 73 trucks through the Karni Crossing containing: wheat, corn, sesame, grains. In addition, 651,000 liters (14 tankers) of fuel and 326 tons of heating gas (11 tankers) were transported through the Nahal Oz Crossing. Approximately 74 trucks of humanitarian aid and supplies were transferred into the Gaza Strip today via the Kerem Shalom and Sufa Crossings: 24 trucks through the Kerem Shalom Crossing containing: reproduction eggs, frozen vegetables, dairy products, fish, meat, beans, halvah, toilet paper, and diapers. 50 trucks through the Sufa Crossing containing: coffee, rice, flour, salt, sugar, peas, fruit, and oil. Approximately 112 trucks of humanitarian aid and supplies were transferred into the Gaza Strip today via the Kerem Shalom and Karni Crossings: 45 trucks through the Kerem Shalom Crossing containing toilet paper, medical supplies, electronic supplies, oil, meat, frozen vegetables, flour, and fruit. 67 trucks through the Karni Crossing containing wheat and corn. Approximately 39 trucks of humanitarian aid and supplies were transferred into the Gaza Strip via the Kerem Shalom Crossing containing: diapers, toilet paper, medical supplies, oil, pasta, fish, meat, frozen vegetables, rice and tea. A total of 3,401 tons of humanitarian aid and fuel were transported. 79 trucks through the Karni Crossing conveyer containing: wheat, corn and animal feed. Kerem Shalom Crossing - 34 trucks were unloaded. In addition, 635,000 liters (14 tankers) of fuel and 242 tons of heating gas (12 tankers) were transported through the Nahal Oz Crossing. Approximately 147 trucks of humanitarian aid and supplies were transferred into the Gaza Strip today via the Kerem Shalom, Sufa and Karni Crossings: 55 trucks through the Sufa Crossing containing: meat, fruit, sugar, diapers, flour, peas, oil, carrot, coffee, fish, rice, garlic. 64 trucks through the Karni Crossing containing: wheat, grains, sesame, corn, barley. 8 trucks through the Kerem Shalom Crossing containing: diapers, toilet paper, tea, soup, medication, blankets and 20 trucks of food donated by Egypt. Approximately 65 trucks of humanitarian aid and supplies were transferred into the Gaza Strip via the Kerem Shalom and Sufa Crossings: 11 trucks through the Kerem Shalom Crossing containing: toilet paper and diapers. 54 trucks through the Sufa Crossing containing: sugar, flour, salt, fruit, powdered milk, hatching eggs, cocoa, ketchup, mayonnaise, & food preservatives. In addition, 679,000 liters (15 tankers) of fuels and 334 tons of heating gas (12 tankers) were transported through the Nahal Oz Crossing. 20 trucks of humanitarian aid and supplies with a total weight of 301 tons were transferred into the Gaza Strip today via the Kerem Shalom Crossing containing: vitamins, diapers, toilet paper, fruit, oil, frozen meat, tea, coffee, powdered milk, hatching eggs, corn, pasta, carrots and tahini. Approximately 152 trucks of humanitarian aid and supplies were transferred into the Gaza Strip via the Kerem Shalom, Sufa and Karni Crossings: 59 trucks through Sufa Crossing containing: meat, fruit, sugar, bananas, flour, coffee, garlic, oil, pasta, carrots. 73 trucks through the Karni Crossing conveyer containing: wheat, grains, barley. 20 trucks through the Kerem Shalom Crossing containing: diapers, pasta, tea, oil, toilet paper, fish, medicine, meat preservatives. A total of 1,567 tons of humanitarian aid and fuel were transported. Sufa Crossing - 54 trucks were unloaded. Kerem Shalom Crossing - 22 trucks were unloaded. In addition, 640,000 liters (14 tankers) of fuel and 248 tons of heating gas (14 tankers) were transported through the Nahal Oz Crossing. A total of 3,877 tons of humanitarian aid and fuel were transported. Sufa Crossing - 72 trucks were unloaded. Kerem Shalom Crossing - 21 trucks were unloaded. Karni Crossing conveyer - 61 trucks were unloaded (2,800 tons of wheat, legumes, corn and animal feed) In addition, 695,000 liters (15 tankers) of fuel and 320 tons of heating gas (12 tankers) were transported through the Nahal Oz Crossing. A total of 3,810 tons of humanitarian aid and fuel were transported. Sufa Crossing - 59 trucks were unloaded. Kerem Shalom Crossing - 5 trucks were unloaded. Karni Crossing conveyer - 81 trucks were unloaded (2,800 tons of wheat, legumes, sesame seeds, corn and animal feed) In addition, 695,000 liters (15 tankers) of fuel and 320 tons of heating gas (12 tankers) were transported through the Nahal Oz Crossing. A total of 1,248 tons of humanitarian aid and fuel were transported. Sufa Crossing - 55 trucks were unloaded. Kerem Shalom Crossing - 23 trucks were unloaded. In addition, 681,000 liters (15 tankers) of fuel and 272 tons of heating gas (13 tankers) were transported through the Nahal Oz Crossing. A total of 906 tons of humanitarian aid and fuel were transported. Sufa Crossing - 30 trucks were unloaded. Kerem Shalom Crossing - 8 trucks were unloaded. In addition, 225 tons of heating gas (10 tankers) were transported through the Nahal Oz Crossing. About 160 trucks of humanitarian aid and supplies are being transferred into the Gaza Strip via the Kerem Shalom, Karni and Sufa Crossings. 63 trucks passed through Sufa Crossing containing: flour, fruit, sugar, cooking oil, frozen meat and fish. 19 trucks (donated by Egypt) passed through Kerem Shalom Crossing containing: rice, sugar, oil and dairy products. Approximately 80 trucks passed through the Karni Crossing containing grain. About 70 trucks of humanitarian aid and supplies were transferred into the Gaza Strip via the Kerem Shalom and Sufa Crossings: 63 trucks passed through the Sufa Crossing containing: fruit, sugar, humus, flour, coffee, baby formula and oxygen masks. 6 trucks passed through the Kerem Shalom crossing containing: oil, flour, beans and tomato sauce. In addition, 25 Palestinians entered Israel for medical treatment in Israeli hospitals. About 160 trucks of humanitarian aid and supplies were transferred into the Gaza Strip via the Karni and Sufa crossings, as well as the reopened Kerem Shalom crossing. A total of 4,073 tons of humanitarian aid and fuel were transported. Sufa Crossing - 60 trucks were unloaded. Karni Crossing conveyer - 76 trucks were unloaded (2,700 tons of wheat and animal feed) In addition, 1,014 liters (21 tankers) of fuels and 300 tons of heating gas (7 tankers) were transported through the Nahal Oz Crossing. A total of 1,152 tons of humanitarian aid and fuel were transported. In addition, 918,000 liters (19 tankers) of fuel and 169 tons of heating gas (7 tankers) were transported through the Nahal Oz Crossing. 400,000 liters (18 tankers) of fuels were transported through the Nahal Oz Crossing. A total of 3,924 tons of humanitarian aid and supplies were transported.